Talia Carner is the former publisher of Savvy Woman magazine and a lecturer at international women’s economic forums. This is her fourth novel. At first, I had a difficult time getting into this book – the sense of place was fine, but I was confusing the three American women, Amanda, Jenny, and Brooke. Within a chapter or two, I had them sorted, and as it was Brooke’s story I paid closest attention to her. Overall, this was an enjoyable read – an action packed spy thriller with a cast of mostly women, and the author should be commended just for that. It’s also a stark reminder at what life in Russia was, just as we were starting to peep through what had once been the Iron Curtain. Those of us who were born in the seventies and grew up in the eighties lived with terms like “cold war” and “glasnost” being tossed about like different colored balloons on the wind, and reading a novel set just at the dawn of the new Russian capitalism was almost a time capsule for me. Politics and history aside, Carner tells a good story. As I said, her sense of place is vivid, and for the most part her characters stand out. Svetlana, with her Soviet speaking voice and matching hair, really stood out for me, as did Brooke, the lead character who seemed to be caught between the desire to help and the need to stay alive, at times. I’ll confess that there were times I wanted to punch their driver/guide Aleksandr, just for being a lazy, annoying idiot. It takes a lot for me to want to cause harm to a character, so kudos for that, Ms. Carner. 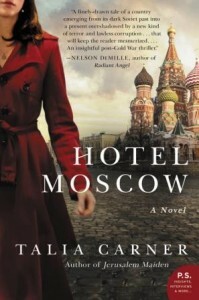 If you like old-school thrillers, where the danger is equal parts cerebral and physical, you’ll like Hotel Moscow. It’s an intriguing story with some great character moments, and I was never bored with it. Goes well with a bowl of borscht and a shot of vodka.